At FGS Composites we can create new products as well as assist you with incremental improvements. We offer great products that perform well in a wide variety architectural designs. Fibre Reinforced Polymers (FRP) are widely used in the architectural industry because of their design flexibility, high strength-to-weight ratio, non-conductivity, low maintenance, affordability, low maintenance, UV resistance, and flame retardance. At FGS, our in-house custom shop gives us the capability to manufacture original patterns, moulds, and fibreglass components. We can turn ideas into reality. We have far reaching capabilities including CNC routers to create precision wood moulds – among much else. 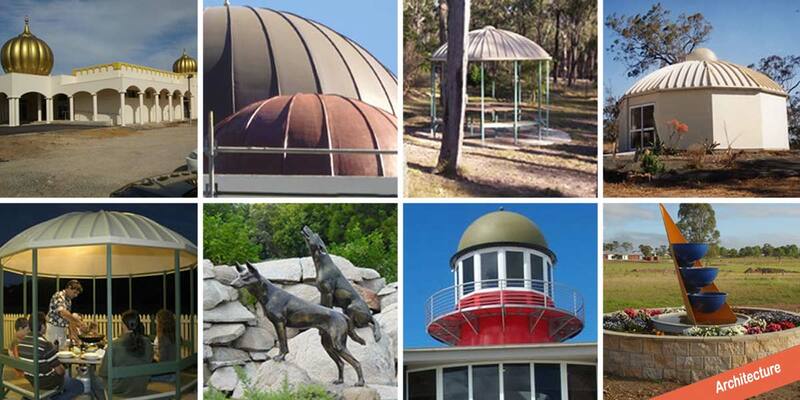 FGS Composites are award winners in the design and manufacture of dome roofing systems. Dome roofs are self supporting, easily transportable, made from durable, high quality materials and only require minimum assembly time. They also come in a great choice of colours and consist of 12 panels, which simply bolt together. Built according to Australian standards. Can be insulated and soundproofed. Electrical cabling and plumbing can be installed. Made to last for a long time with little maintenance required. Can be assembled on the ground, then affixed in place by a small crane. A 9 metre dome roof can be legally transported on a trailer without a costly permit. Fraser Coast Regional Council – FRP boardwalk shade sail design, production and installation. Hervey Bay RSL, Catholic Church Brisbane, Mosque Brisbane and Sikh Temple Melbourne – Dome roof design, production and installation to customer specifications. Our strengths are inherent in our experience; comprehensive knowledge of composites and our precision capabilities. We will design, manufacture and build for your architectural needs. Our specialised resins are perfect for a wide variety of architectural applications such as domes, cupolas, or other roof structures, cornice and other types of molding or trim, wall coverings, wall panels :– to name a few. In addition, we offer pultruded structural components such as decking, walkways, handrails, as well as pultruded shapes such as beams, rods, channel, square tube, rectangular tube and angle.